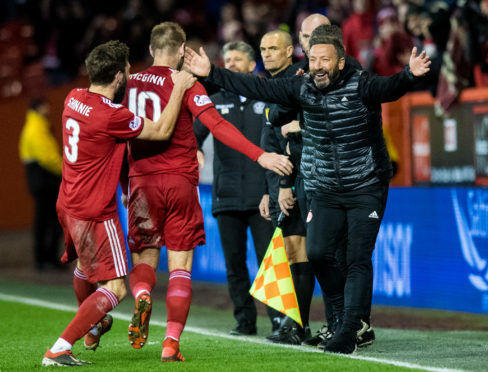 Aberdeen manager Derek McInnes celebrates with goalscorer Niall McGinn. The 3-1 victory over Motherwell, capped by two goals in the last 20 minutes from Niall McGinn, gave the home faithful their first league win in three months to cheer and McInnes wants the Dons to kick on and avoid a similar run in the future. Max Lowe had put Aberdeen in front inside four minutes before Jake Hastie levelled the scores. For much of the second half it appeared frustration would linger in the Granite City until McGinn struck, his fourth goal in as many games in a red shirt. 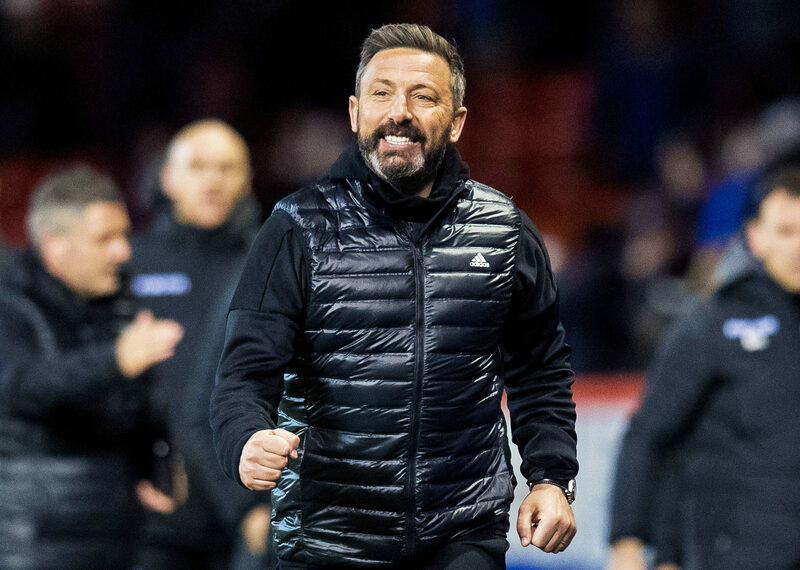 Their last league win at Pittodrie at last night prior to last night was the 2-0 triumph over Hearts on December 22, with McInnes believing last night was long overdue. He said: “It was something I knew we were capable of. Ordinarily, your away record would mirror your home record but for whatever reason, we’ve been stronger on the road. Tonight we had the answers to score again and it was no more than my players deserved. McGinn found the net just twice in the first half of the campaign but has now got six since the turn of the year, plus another for Northern Ireland against Estonia last month. He has lifted the goalscoring burden at just the right time, much to McInnes’s delight. He added: “He’s in good goalscoring form for club and country just now. His delivery, both from open play and set-pieces, was strong. I’m pleased Greg Stewart had an impact off the bench and it was clear how important was to my team to get into Europe. “Niall’s training – he’s had a hip issue we’ve tried to manage. He’s not had a lot of training and we were throwing him out on a Saturday. He wasn’t getting any real rhythm. He’s now more able to perform at his best. Wide players like him need speed and trickery and ability to change direction. Their game is about that.